Michigan gardeners with small backyards can plant dwarf fruit trees. Choose dwarf varieties of tart cherries, apples, peaches, pears or plums or grow subtropical fruits like lemon or orange, keeping the containers indoors during the winter. Plant dwarf fruit trees in the spring. While dwarf trees bear fewer fruits that standard-sized trees, they make great patio additions, they bear high-quality, flavorful fruit, and they allow Michigan gardeners to grow fruits that don't normally bear in their area due to the cold climate. Cut a piece of mesh screen that covers the bottom of a 5 gallon container, using scissors. This prevents potting soil from washing out each time you water. Combine equal parts of sand, peat and perlite to create your own potting mix. You can also use a commercial potting mix. Fill your container one-third to one-half of the way full with this potting mix. Pull your dwarf fruit tree from its container. Massage the root ball between your hands to loosen it. Unwind tangled roots and trim the tips of broken roots using scissors. Place the tree in the container so it sits in the same depth as it did in the nursery container. Fill the container with potting mix to within 1 inch of its lip, firming the potting mix around the base of the plant. Water the newly planted dwarf fruit tree until water flows out the drainage holes at the bottom of the container. 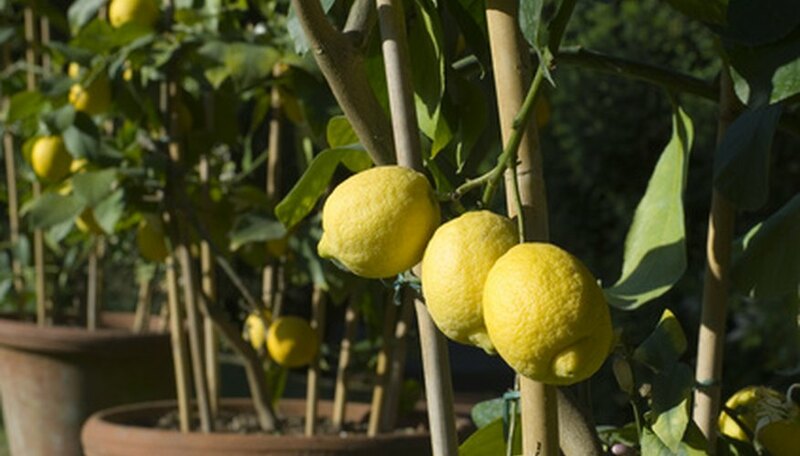 Choose a site that will give your dwarf fruit tree full sun, protection from the wind and well-draining soil. Dig a hole twice the size of the tree's root ball. Remove rocks, sticks and weeds from the soil. Jab your shovel at the bottom of the hole to loosen the soil there, which helps the tree's roots adapt. Remove your dwarf fruit tree from its container. Massage the root ball to loosen it, unwinding and trimming the ends of roots in the same manner as you would for the container-planted dwarf fruit tree. Place the fruit tree in the ground and check to ensure its trunk is vertically straight. Then backfill the hole with soil, firming it around the tree's trunk. Water the newly planted dwarf fruit tree until the ground becomes saturated and soil compresses around the base of the tree. Stake dwarf fruit trees to give them support. Use a 2- to 3-foot-long wooden stake and place it 12 inches from the tree's trunk to avoid damaging the roots. Tie the tree to the stake using rope.